Most people are already aware that there were many similarities between Tony Blair and Margaret Thatcher. Both were conviction politicians, both had political love-ins with US presidents and both liked to talk tough. Affable Tony could always ham it up with a good dose of media-friendly mock sincerity and tough talking. Thatcher and her PR people cynically forged the template for that. And both had a tendency to ignore that damned nuisance called public opinion and to land the country into a gruesome mess not of its own choosing. Margaret Thatcher once famously stated that there is no such thing as society, implying that the individual is paramount and should not be held back by it – or at least by those sections of society for which she had a particular dislike. And, as a woman of conviction, there were plenty of those around. ‘Freedom of the individual’ was her mantra as she went on to grind organised labour into the ground, whom she labelled as “the enemy within,” to implement a range of policies in favour of the downtrodden rich and to put in place a variety policies to attack the ‘work-shy’ poor. As a result, laudable principles pertaining to notions of equality, communality and justice have been frozen out by the excessive individuality and rampant debt-fuelled consumerism that we witness today. Caught between old style principled union leaders, like Arthur Scargill of the National Union of Miners, and Thatcher’s self-righteous preaching, the class struggle was laid bare in 80s Britain. The unions lost and Thatcher presided over the virtual destruction of UKmanufacturing industry and deliberately crushed any real opposition to her governments’ policies. Many in Britain waited 18 years for a Labour government to come to power. However, by that time (1997) the party had reinvented itself as a Thatcher-hugging, right wing, media-friendly concern: a watered down version of the former Conservative regime with a middle class lawyer at the helm, looking like a friendly bank manager, sounding like a corporate executive and acting like a certain former grocer’s daughter. Some might say that was Thatcher’s finest achievement: the creation of the user-friendly Tony Blair to carry on her policies. After three successive election defeats to Thatcher, Labour reinvented itself, ditched its commitment to public ownership and pandered to the right wing media in order to get elected. Under ‘New Labour’, the outcome was not only the abandonment of key principles and values, but also the abandonment of a constituency which had borne the brunt of Thatcher’s policies. The far right in Britain has had some degree of success in recent times by tapping into the frustrations within white working class communities in economically deprived areas. By abandoning this constituency of voters, Labour has let in the British National Party and the English Defence League (EDL). The EDL has especially attempted to whip up and tap into simplistic sentiments on the back of complex issues pertaining to identity, culture, race and class. Another outcome is that millions of people now feel that none of the major pro-business parties now represent their needs, so they don’t bother to vote and express apathy towards politics and condemn politicians for their lack of moral standards and their hypocrisy. In fact, many have turned away from formal politics and have chosen to vent their frustrations or anger by other means. Other senior politicians came out with similar sentiments. What the disturbances did was highlight the political and moral bankruptcy that Britain is drowning in after decades of policies that Thatcher began and ‘New Labour’ continued. How about we turn Cameron’s words back on him and those who utter similar sentiments? Let us hold them to account, according to the criteria that they use to judge and condemn others. Many of the politicians who were so keen to grasp the moral high ground have in the past sanctioned illegal wars or policies that have led to the deaths hundreds of thousands of people. Think back to the sanctions imposed on Iraq in the 1990s that led to the deaths of 500,000 children, all because a political leader would not adopt pro-western policies. But you don’t have to think back that far. In Libya, a similar war strategy, fully backed by Cameron, was put in place to remove another leader who won’t tow the line. Such imperialist wars have been justified on the lie of ‘humanitarianism’. As the body count piles up in Syria right now, so does the hypocrisy. Many of those who took part in the disturbances were in many respects the victims of ‘greed is good’ neo-liberal policies. Top politicians, with the media in tow, have for a long time been cheerleaders of the ‘free market’ approach and the criminals on Wall Street, or in the City of London, who eventually plunged millions into poverty across the world. Look around the UK – the social deprivation, the rich who have got even richer and the inequality gap that has become a chasm. Then ask, what are the real crimes? Who are the real criminals? Who has done the most thieving, the most robbing, the most looting? Who has indulged in devastating vandalism and created fires from Libya to Afghanistan? Who has looted from the poor across the world and, through the system in place, has ensured wealth flows from bottom to top? Who has marched into other people’s countries and smashed them up? Whose criminality is the worse? The politicians, the financiers, the proponents of economic dogma, which serves as a masking device for brutality, or the folk who have borne the brunt of it all and who then react? While people who took to the streets did loot and help themselves to all manner of consumer goods, just who did they take their cue from? The great role models of the age, no doubt – the take now, pay later mentality of corporate Britain and the bankers – or, in the case of the bankers, take now and take again, but never pay back. Such hypocrisy is a lingering legacy of the route which Thatcher’s neo-liberalism then Blair’s neo-imperialism set the country on and continues on today. There was never any need for things to out turn this way. Unfortunately, they have. And despite the euphoria at the time, the Labour Party coming to power in 1997 did little to change the course of events. Brand Blair was a PR person’s delight. There was no talk of the ‘s’ word (socialism) and Tony represented ‘New’ Labour and new values. He was tuned in and turned on to the meaningless ‘cool Britannia’ sound-bite manufactured by the media at that time. 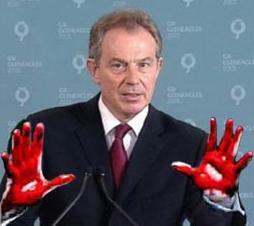 Indeed, Blair’s spin-doctors did a great job in placing the Tony brand at centre stage. But the new brand soon became the old brand — grey, worn out and discredited. There was no substance to it. The small print proclaimed: moral crusades included. Blair took Britain to war no less than five times — an achievement unequalled by any other British PM. Brand Blair was more often than not to be seen on the moral ground espousing the values of ‘freedom and democracy’, standing shoulder to shoulder with fellow war monger George W Bush. Tony was always at hand with gleaming smile to gloss over the murderous wrongdoings. He whitewashed clean with his catchy speeches and the ‘‘I’m just an ordinary guy like you’’ persona. He became Bush’s PR man par excellence. As was the case with Thatcher, Blair was the handmaiden of the rich and powerful and helped deliver the Britain into the hands of elite interests who were intent on shattering the post WW2 Keynesian consensus and who are now intent on violently casting the world in their own image. It therefore comes as little surprise that since stepping down Blair has reaped tremendous rewards in return. In 2012, The Telegraph newspaper in the UK discussed Tony Blair’s jet set lifestyle and hisUK property portfolio of seven homes worth £14 million, including a £4 million Georgian townhouse in central London and a country estate (http://www.telegraph.co.uk/news/politics/tony-blair/8999847/Blair-Inc-How-Tony-Blair-makes-his-fortune.html). Blair is paid in the region of £3 million a year to advise both JP Morgan, the US investment bank, and also Zurich International, the global insurer based in Switzerland. On top of that he runs his own consultancy firm – Tony Blair Associates – which advises the oil and gas rich governments of Kuwait and Kazakhstan. A leader like Blair in part represents the end product of the US and UK Establishments’ decades-long attempt to cement the hegemony of elite interests by subverting and corrupting major components of the British left, not least the Labour Party (http://www.lobster-magazine.co.uk/articles/rrtalk.htm). While the processes set in place that enabled a person such as Tony Blair (and now Miliband) to lead the former ‘party of the workers’ were certainly not all down to Thatcher’s doing, there is no denying that she most certainly paved the way.